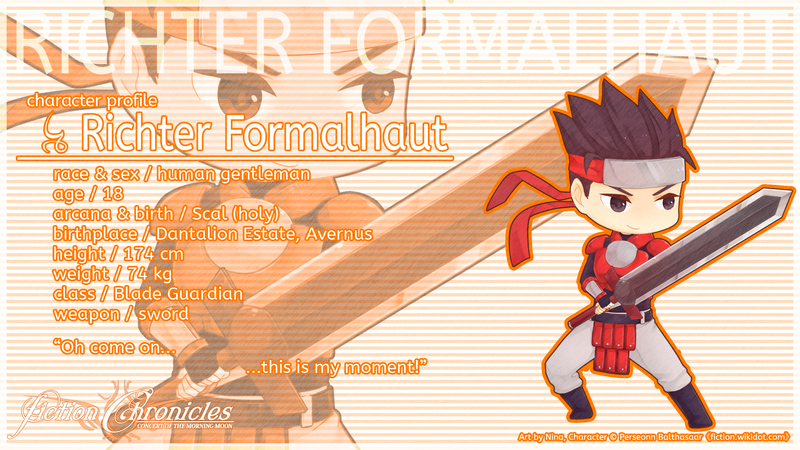 Aloysius Richter Formalhaut is a human Blade Guardian from a small village near Nocte Regem. He is the son of Winifred and Edgar. Decided that he will live a hero's life, Richter sets his foot to a nearby forest and unfortunately, witness the ruin. He sought to restoring the ruined world, and met with Eurystheus and Sauron who agrees with him. As he slowly came to term on what it takes to be a proper swordsman, he met Cathabell and her party who is working toward recreating the world. He has black eyes and black spiky hair. He is very spirited, righteous, has a strong sense of justice, but a bit naive. He is quite short-tempered and often acts without second thought. His choices are not outside of the box and are often based on what people commonly do. He is somehow very savvy about his self-proclaimed hero position. In battle, Richter wields a sword and mainly function as both physical damage taker and damage dealer. He excels in baking breads and despite his short temper, he takes great care in making breads. When idling in the garden, he usually hangs with Eurystheus for combat lessons, along with Renn and other physical combatants. His journey represents his roots of abilities, talents, and potential. He has made a decision to start fresh. He is open to new possibilities within himself that he has not yet explored. He know he wants to do something, but he does not know what it is. Richter's name was taken from a vampire hunter in Castlevania series. His last name, Formalhaut is a misspelling of Fomalhaut, as well as artifact name which belonged to early version of Perseonn. His baptized name was randomly picked. He is 18 years old during the event of Concert of the Morning Moon, 174 cm tall and weighs 74 kg. Richter has three main design points: bandanna, Red armor, and White pants. Over time, he evolves from merely being a discount Dart Feld (The Legend of Dragoon) into a full-fledged character on his own. In many of the Soul series version, he has a second costume which was based off Knight Blazer from Wild Arms 2, named "Cliche Incarnate". The term was coined by Gatkowski after reading the initial description of Richter. Soulcalibur III is his first appearance, and was based off the aforementioned Dart Feld. The second costume is also the first appearance of his Cliche Incarnate form. The Soulcalibur IV version is more less upgrades to his looks. The Broken Destiny is an attempt to use an alternate color scheme, but I ended up missing his White pants. Tanleeseng made the second costume, which is closer to his SC5 version and looks way better. 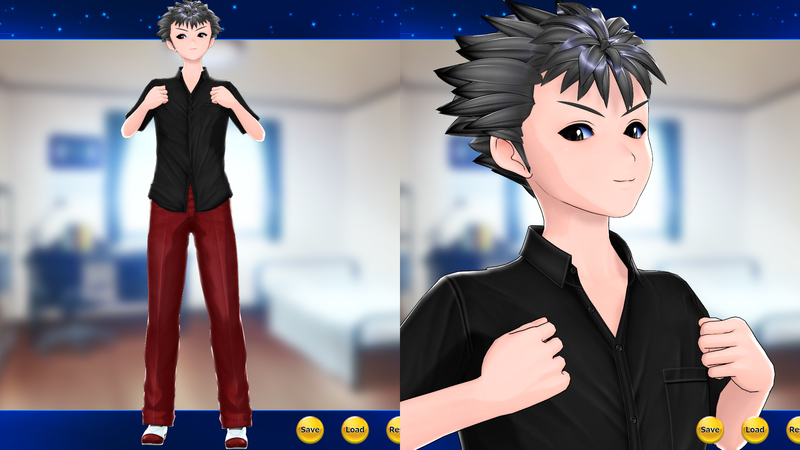 The beginning of his matured concept, opting for generic anime protagonist look. Since the game lacks small armors, I have to settle with the New Centurion with belt to crop its length. Unlike the previous versions, the Cliche Incarnate costume now follows his first costume's moveset. 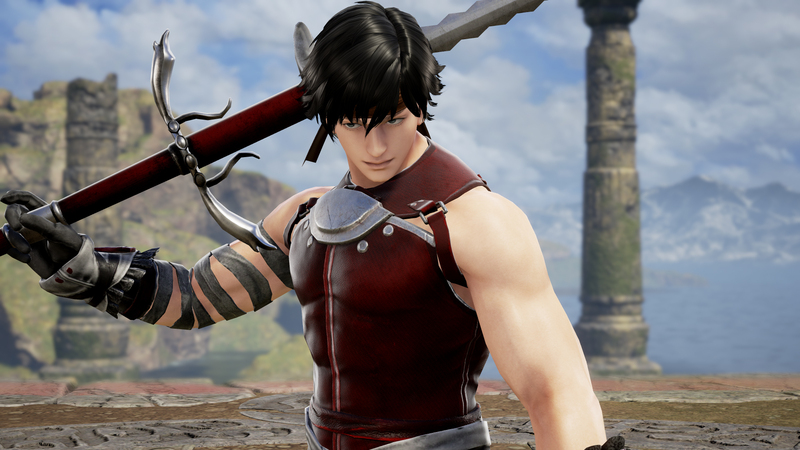 The Costume 3 is a callback to his Soulcalibur III version, with spiky hair and crab Red armor. A preliminary design for him, retaining all the key design points. 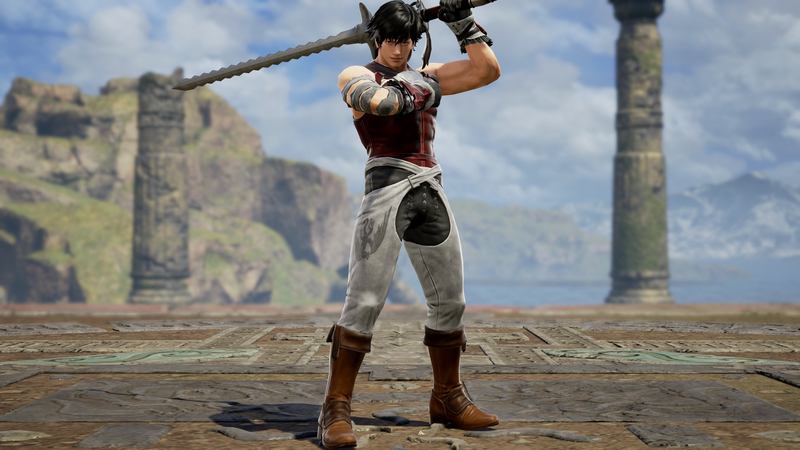 It bugs me that by default, Soulcalibur VI does not provide simple belts. His physique was changed to be smaller, a keypoint in his storyline. He is based on his Soulcalibur IV look, thus he retains his spiky hair. In Dynasty Warriors 7, almost all the armors looks to expensive for him to buy, I settled for a simpler Red shirt. The same reason is used for his Samurai Warriors 4 version. In Dynasty Warriors 8, he can have a fitting armor that doesn't look shabby, nor too expensive. The Costume 2 is also the debut of the ending version of him.